ULTRAZONE Laser Tag in San Diego is a different experience every time you play. Games are never the same because you are different in every game. This is a live action experience, where every player affects every other player. The thrill is unique, and no two games are the same. That means the excitement never stops. Laser tag is an action adventure experience that takes the “capture the flag” game from the 1950’s and incorporates all the computer and electronic gaming advances seen in the past 30 years. The game uses lasers to tag an enemy instead of the traditional hand capture. The original goal was to take the rising tide of interest in role play games and bring players out of their homes for true interaction. “It was like being inside a video game ” was the highest compliment. 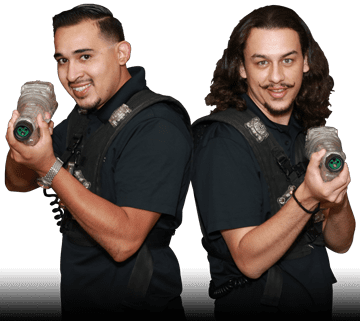 ULTRAZONE now offers laser game players the most dynamic immersion into the laser tag experience with a system available in only four other sites in the country. Remember at ULTRAZONE, you truly are the game. What’s Up At The Zone?